Mandela’s anonymity was all the more ironic as, for over a decade, the African National Congress and the international Anti-Apartheid Movement had singled him out, from among all the other political prisoners in South Africa, as the symbol for its campaign. Images of his face from the Rivonia trial adorned posters and badges around the world, and in 1984 the song “Free Nelson Mandela” by the ska band The Specials helped to spark a movement by musicians, culminating in the “70th birthday concert” in 1988. For the last twenty three years of his long life, Mandela had little privacy and no anonymity. Instantly recognized around the world, he became a vessel for many people’s hopes and aspirations, and a symbol of the new South Africa. For Africans, he exemplified leadership and dignity in overcoming racism and oppression: he was the leader they deserved. For white liberals, his forgiveness was a reward of which they could hardly have dreamed. Identities were projected onto him. When Mandela visited America after his release from prison, one young journalist prefaced her question with the words, “as an African American, do you…” before he gently reminded her that he was, in fact, an African. The way he has become idolized and idealized tells us more about the world’s need for such a figure, than about Nelson Mandela himself. 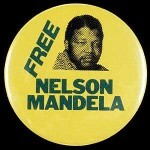 Mandela rapidly became the world’s most famous political prisoner. But, due to his refusal to disavow violent struggle, he was not adopted by Amnesty International as a “prisoner of conscience.” Amnesty International was split on this issue and decided, as a compromise, to adopt him as a “forgotten prisoner.” More than forty years later, Amnesty International offered Mandela the award of “ambassador of conscience,” and with characteristic grace—and forgiveness—he accepted. Mandela was also of course labeled as a “terrorist” and the U.S. government needed to make special exceptions for him to visit the United States after his release. He was only removed from the terrorist watch list in 2008. Some of his comrades, now leading South African political and business leaders, remain on the list, and only a few weeks ago, Mandela’s comrade Tokyo Sexwale was detained for questioning on arrival in New York. Are these, as The Telegraph journalist would write, “murky” aspects of Mandela’s past, or central to understanding this man and his greatness? The struggle to overthrow Apartheid was a revolutionary struggle, characterized by rigorous internal discipline that included, when required, secrecy and deception. Cadres of the ANC and SACP worked underground within South Africa and travelled clandestinely to Angola, Algeria, Ethiopia, the Soviet Union, Cuba and East Germany for military training. The ANC strategy had four pillars, one of which was violent armed struggle framed by the ethical parameters of a just war, constructed on the strategic imperative to capture and maintain the moral high ground as a means to isolate the regime and build a world-wide front against Apartheid. In 1985, the ANC committed itself to “people’s war,” spearheaded by its armed wing, Umkhonto we Sizwe, which carried out selective acts of “armed propaganda”. In parallel, massive unarmed confrontation, including strikes and stoppages, boycotts and massive demonstrations, posed a greater challenge to the Apartheid regime—showing that the people could not indefinitely be ruled against their will. The historian of the ANC, Tom Lodge explains how MK’s “theatrical” violence helped animate the non-violent mass movement, demonstrating the vulnerability of the oppressor. But the central fact is that violent and non-violent elements of the revolutionary strategy were pursued by a united leadership with clear goals and strategies. The ANC leadership never wavered from its foundational objective of achieving a democratic non-racial South Africa, and regarded all else—such as the criminalization of Apartheid—as subject to negotiation. That leadership also was determined to avoid the dangers of “militarism”—i.e. the isolation of military activity from political guidance. It was precisely such a cohesive and disciplined leadership, possessed of clarity in distinguishing its ultimate goals from its tactical calculations, that could seize the moment at which it could successfully negotiate an end to Apartheid. The ANC thereby achieved the democratic revolution it had sought since its foundation in 1912. Whether and how it should pursue the second stage of the revolution was the focus of an unresolved internal power struggle between African nationalists and the ANC left. But neither group within the party was prepared to break ranks—they knew that without unity, they were destined to fail. On his release from prison in 1990, many ANC members feared that Mandela had “sold out” to the National Party government. His first speech was drafted collectively by the leadership, and represented positions unchanged from 26 years earlier. This indicated that despite his strong advocacy of pragmatism within the ANC’s internal debate, he would respect party discipline. Thank you Alex for this valuable piece ” Recognizing Nelson Mandela”. Having been for years part of the UN effort to bring down the system of Apartheid, I’d like to thank Alex for his honest and thoughtful expose on Madiba. Indeed, we have changed a lot since April 1994 in understanding the role Nelson Mandela had played in moderating global perceptions of right and wrong. Whether we appreciate it, or not, he has changed us too, obviously for the better.